Have fun with this cool white and blue sport Pogo Stick. It provides a good workout that's both fun and active. The metal frame is equipped with a cushion of precision-made foam to provide a safe and soft surface. 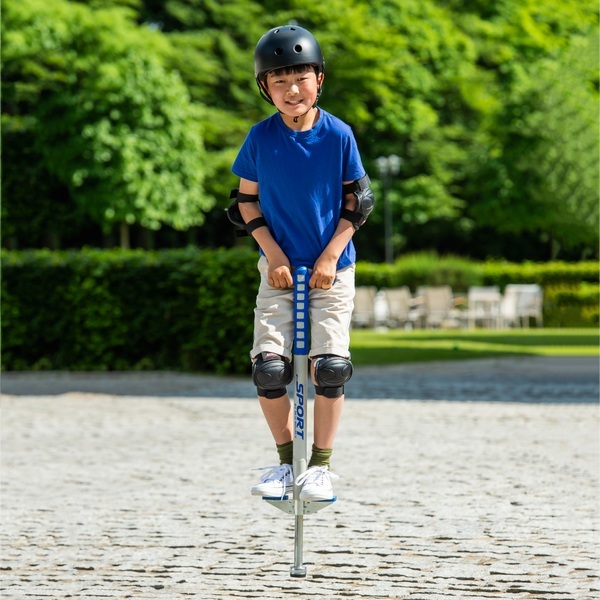 With easy grip handles and non-slip footpads you can enjoy jumping around on the pogo stick without slipping. The contact tip of the toy is covered in rubber, holding your position steady while you hop. EU Warning: Not suitable for children under 5 years of age. Protective equipment should be worn (knee, wrist, elbow pads and helmet) Adult supervision recommended. Not to be used in traffic.